This October 2018 Tyk will be at the Nordic APIs Platform Summit, hosting a variety of workshops and talks on API Management. 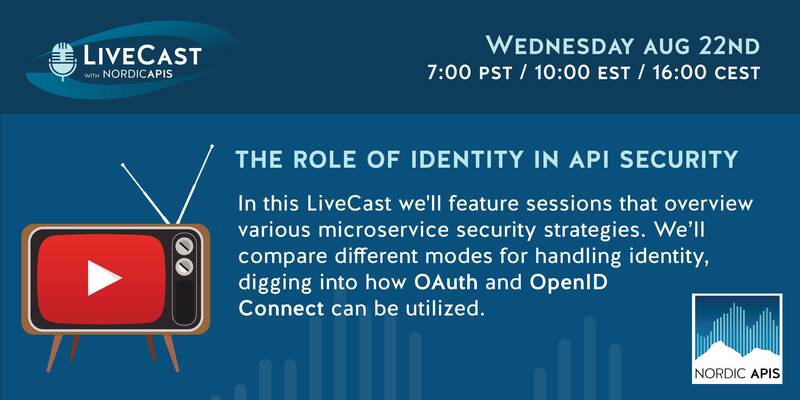 In the run up to this event, the Nordic APIs team asked us to speak at their recent LiveCast on API Security and, specifically, the role of identity in API Security. We were only too happy to share our own approaches to choosing the right authentication mechanisms for your microservices. After all, with so many methods out there to choose from, how do you know which is the best one? My 15 minute talk is here to help, with a common-sense look at authentication whether you’re working in a highly regulated industry or using open source solutions. From traditional access tokens through to OIDC for APIs running across multiple data centres, I recommend methods that are pragmatic, useful, and still innovative, but which don’t leave you tearing your hair out! Access my talk, along with Travis Spencer’s on digging further into OAuth and OpenID Connect via the Nordic APIs Livecast page on YouTube. Got any questions? Tweet us at @tyk_io and we’ll be happy to answer.